If you are looking for a great indoor or outdoor wooden guinea pig cage, we are glad you are here! In this article, you will learn about some of the best wooden guinea pig cage options for one, two, or more guinea pigs! Your guinea pig is going to spend the majority of his life inside his hutch. So you want to make sure that the enclosure you provide is sufficiently roomy. One guinea pig: 7 square feet is the minimum you should provide for a single pig. Two guinea pigs: Aim for anywhere from 9 to 11 square feet, the larger the better. For more than two guinea pigs: add an extra 2 to 4 square feet per pig. Guinea pigs don’t climb, so they don’t need a very tall habitat. But be sure to allow for at least 12 to 18 inches of overhead space to create sufficient ventilation throughout the cage. For a more detailed guide to guinea pig cage sizing and dimensions, please review this informative article. It is very important to select only safe wood for your guinea pig cage. Oak, cherry, apple, aspen, linden, poplar, basswood and fir are all safe woods for these animals to chew on and live in. While it can be difficult to find fruit woods for building, these are great for chewing! There are certain woods that are dangerous for guinea pigs to come in contact with. Willow wood is safe except for white willow, which contains a natural form of aspirin! Cedar is a well-known wood that is great at masking the smell of guinea pig waste, but unfortunately is toxic. 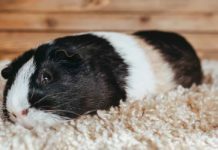 If your guinea pig comes in contact with cedar wood, the phenols that create that amazing smell can cause permanent (and sometimes fatal) respiratory and liver damage. The same holds true for pine wood, which also emits a masking scent that people tend to love. But that scent comes from the same types of toxic chemical compounds (phenols) that makes cedar wood so dangerous. If you can find kiln-dried pine wood shavings, these carry less risk, but for the most part, it is best to avoid pine. Eucalyptus wood and redwood also emit phenols, so while these are less commonly used in pet products, be sure to keep an eye out for them. Another word of caution when choosing wood habitats, toys and accessories – be sure to steer clear of treated woods, which may contain toxic dyes, chemicals, glues and adhesives that could poison your guinea pig. If you can’t find any information about the wood structure, skip it to be on the safe side. And if you choose any natural woods from fruiting trees or vines, be sure they haven’t been sprayed by insecticides, pesticides or herbicides, which could kill your cavy if ingested. 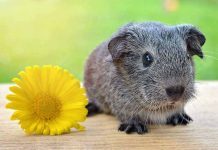 One question so many first-time guinea pig owners have is whether it is better to offer an indoor wooden guinea pig cage or an outdoor wooden guinea pig cage. There are pros and cons to providing an indoor versus outdoor wooden guinea pig cage. Under ideal circumstances, you might consider offering your piggies both options as time and weather permits! More protection from predators and the elements. More play and interaction time with you! More sensory enrichment and stimulation. Opportunity to graze living grasses (you can see an example in this cute video). Exposure to filtered natural sunlight (always provide shade). While a wooden guinea pig cage can make a great choice for your cavy’s permanent home, here is one key safety tip to keep in mind. Guinea pigs chew incessantly! They have to, because their incisors (long front teeth) never stop growing. Severe health risks can develop when your guinea pig doesn’t have appropriate material to chew, which keeps those teeth filed down. But this also means that your guinea pig will naturally be tempted to chew on her wooden cage. This will likely be true even if you provide lots of other suitable chew toys such as wooden blocks, cardboard rolls and other enriching items. So you will want to do a weekly “perimeter check” to make sure your wooden guinea pig cage is still fully intact. This may also mean you will need to accept having to change out a wooden cage more frequently than a wire or acrylic cage. If not that, you will at least need to patch up the wooden cage more often. Of course, ventilation is a key component of any safe and healthy guinea pig hutch. But you don’t want your guinea pigs to create so much ventilation that they escape! Since it can be difficult to find a wooden guinea pig cage that comes pre-made, many owners will repurpose a rabbit hutch to use for their piggies. Read on for some great hutch recommendations. If you take this route, pay close attention to the spacing of any wire cage bars! Aim for spacing of 1.5 inches or closer to keep noses and toesies safely inside. 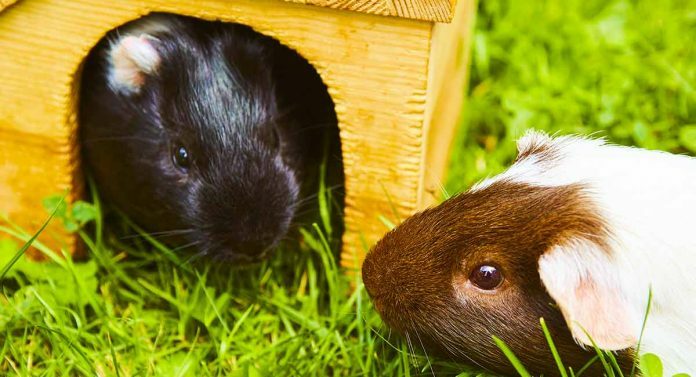 Whether you are using an outdoor or wooden indoor guinea pig cage, the number one ongoing issue you are likely to face is keeping it clean and odor-free. Wood habitats provide a number of lovely benefits to your cavies, but they definitely aren’t the easiest type of material to keep clean and sanitary! However, daily cleaning is very important, because guinea pigs don’t like unclean living quarters any more than people do. Here, there are several approaches that can work to extend the life of your wooden guinea pig cage. Some owners recommend rubbing coconut or almond oil over the wood as a type of safe treatment to keep liquid waste from seeping into the wood or staining the surface. You can also put down a thick layer of fleece, a plexiglass panel cut to fit the size of the cage bottom, a plastic tray, or some other non-porous solid surface. Avoid putting down wire flooring, as the bars will hurt your guinea pig’s sensitive feet. 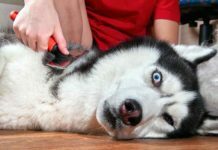 If you choose to use bedding or shavings without a solid layer between the bedding and the wood floor, you will need to lay it down quite thick. Be very vigilant to remove any soiled bedding quickly so it won’t seep through to the wood. Here, guinea pig litter box training (it really is possible!) can help to contain waste matter to one section of the habitat. When choosing cleaning solutions, be aware that guinea pigs are very sensitive to chemical cleaners like bleach and the smell alone can be quite toxic and irritating. Instead, opt for natural cleaners like water with white vinegar or hydrogen peroxide. There can be some advantages to housing your guinea pig indoors if you want to use a wooden guinea pig cage. Even if your guinea pig does manage to chew through the wood without you noticing, she will at least stay inside the house until you can find her, repair the breach and put her back in her cage! This wooden rabbit hutch could make a wonderful indoor guinea pig cage with the addition of an appropriate floor material. You could use a panel of wood, plastic or plexiglass to protect your indoor flooring. Owners also recommend aluminum for a floor. The floor dimensions are 61 inches by 21 inches, which provides nearly 9 square feet of floor space. The ramp leads up to a smaller enclosed area for nesting and hiding that is fitted with its own separate pull-out tray for cleaning. The neatest aspect of this hutch is that the outdoor run portion is detachable, so you could use it to take your guinea pigs outside for some play on nice days! This unique hybrid wood and wire cage is designed to house rabbits indoors. It could be a great choice for an indoor guinea pig hutch as well. The floor dimensions of 51 inches by 19 inches offer just over 7.6 square feet of floor area for running and playing. The wooden hide at one end is perfect for nesting and snoozing. It also comes with some extra accessories including a water bottle, food bowl and hay holder. This picturesque red-and-white trim, elevated indoor/outdoor cage is perfect for both settings. The floor space is 36 inches by 30 inches, which provides 7.5 square feet of floor area for play. At one end, there is an enclosed wooden area for nesting and resting. The bottom is a solid aluminum that features a pull-out tray to make cleaning easy. The wood has a waterproof finish to minimize odors and leaks. If you plan to house your guinea pigs outdoors full time, it is best to select a location that offers protection from drafts, the sun and the elements as well as potential predators. For outdoor cages that rest directly on the grass, consider digging up the sod to lay down a protective predator-proof barrier to prevent snakes and burrowing rodents from getting inside. Another option is to place the cage itself on concrete and use a temporary shelter to give your guinea pigs some outdoor time to run around on the grass. These outdoor wooden guinea pig cage ideas may make the perfect outdoor setup for your guinea pigs! This amazing rabbit hutch can also make a great outdoor wooden guinea pig cage. The available floor space is 90.6 inches (L) by 27.6 inches (W), which gives your piggies almost 17 square feet of play space. The wood used is a safe fir wood. There are two wood ramps that lead to an inner hiding and nesting area where your piggies can find shade and a cozy napping area. The wire mesh siding offers extra safety both to keep your pets in and potential pests or predators out. This hutch is advertised as also being a suitable outdoor home for guinea pigs. The furniture-grade wood is finished with a waterproof antifungal barrier to keep waste from seeping into the wood. The lowest level sits on the ground and offers more than 12 square feet of play area (62 inches by 29 inches). There is a ramp to the second level where your guinea pigs can enjoy shade and quiet for rest time. The second level comes fitted with a slide-out tray for ease of cleaning. The siding throughout is wire mesh for safety. This hutch is raised off the ground on legs, which can offer an extra measure of safety if you plan to house your guinea pigs outdoors on a full-time basis. At 46 inches by 24 inches (7.67 square feet), the floor space would be suitable for one guinea pig to run around. There is an open area and an enclosed hide area for sleeping and nesting. You would need to remove the wire grate that separates the floor area from the slide-out tray. Alternatively, you could place a thick layer of fleece or plexiglass over the wire. We hope you have found this guide to the best wooden guinea pig cage options for indoor and outdoor housing useful as you select your cavy’s new home! Leave us a comment and let us know how it turns out! Halpin, R., et al, “The Perfect Home for a Guinea Pig,” MSPCA-Angell, 2018. Gaudern, C., et al, “Guinea Pig Housing,” QLD Guinea Pig Refuge/Albany Creek Vet, 2013. Rubin, M., et al, “Guinea Pig Housing,” The Humane Society of the United States, 2018. Weisman, J., DVM, et al, “Care of Guinea Pigs,” Purdue University College of Veterinary Medicine, 2018. Quesenberry, K. E. DVM, MPH, DABVP (Avian) et al. “Providing a Home for a Guinea Pig.” Merck Veterinary Manual.